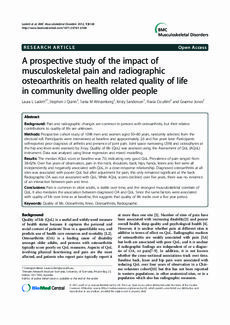 Background: Pain and radiographic changes are common in persons with osteoarthritis, but their relative contributions to quality of life are unknown. Methods: Prospective cohort study of 1098 men and women aged 50–80 years, randomly selected from the electoral roll. Participants were interviewed at baseline and approximately 2.6 and five years later. Participants self-reported prior diagnosis of arthritis and presence of joint pain. Joint space narrowing (JSN) and osteophytes at the hip and knee were assessed by X-ray. Quality of life (QoL) was assessed using the Assessment of QoL (AQoL) instrument. Data was analysed using linear regression and mixed modelling. Results: The median AQoL score at baseline was 7.0, indicating very good QoL. Prevalence of pain ranged from 38-62%. Over five years of observation, pain in the neck, shoulders, back, hips, hands, knees and feet were all independently and negatively associated with QoL, in a dose–response relationship. Diagnosed osteoarthritis at all sites was associated with poorer QoL but after adjustment for pain, this only remained significant at the back. Radiographic OA was not associated with QoL. While AQoL scores declined over five years, there was no evidence of an interaction between pain and time. Conclusions: Pain is common in older adults, is stable over time, and the strongest musculoskeletal correlate of QoL. It also mediates the association between diagnosed OA and QoL. Since the same factors were associated with quality of life over time as at baseline, this suggests that quality of life tracks over a five year period.